In modern airport terminals, hospital complexes, office buildings, sports arenas, university campuses, and retail outlets, there is a growing market for convenient and easy-to-use applications for navigating indoors. With an expected growth rate of 30% by 2022, according to a MarketWatch Report, this demand is accelerated by the presence of advanced sensors in modern smartphones like magnetometers, accelerometers, and gyroscopes. To meet the demand, our team at IBM Research-Ireland built a production-ready indoor positioning system that is more accurate than an existing commercial solution across different smartphone models. Our self-learning, adaptive platform uses a minimal deployment of Bluetooth low energy (BLE) beacons to infer the trips of users, then learn and eventually build tailored magnetic maps for every smartphone model for a specific indoor area. Our novel system provides robust positioning accuracy that is oblivious to the model of the smartphone used either for fingerprinting or for positioning. We experimentally prove, in our recent paper, that our tool provides significant accuracy improvement compared to an established commercial solution based on magnetic field positioning. State-of-the-art indoor positioning systems leverage signals that are frequently present in modern indoor environments, such as WiFi and BLE beacons, as outside positioning methods using GPS signals are not accurate enough to be effective for indoor navigation. An indoor positioning system should be able to detect a user's position inside a building and provide instructions on how to navigate inside it. These systems are used in a wide variety of cases, with their design and implementation capable of supporting specific user requirements. For example, in 2017, an experimental high precision indoor/outdoor voice navigation system for the visually impaired was built and tested by IBM Research-Tokyo. 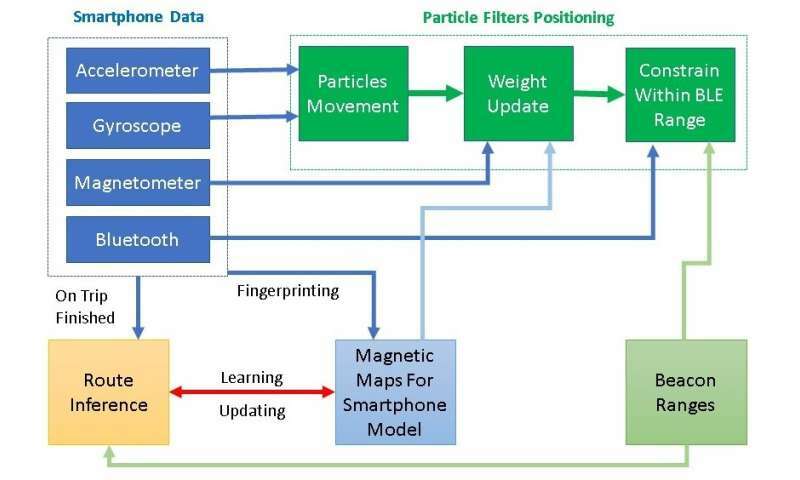 The magnetic field approach is a low-cost method that is gaining in popularity as it requires no specialized sensor installation or maintenance but instead is enabled by sensors already present in smartphones. However, discrepancies between different sensor readings across smartphone models have a severe impact on the indoor positioning accuracy. Existing approaches based on the magnetic field approach require a fingerprinting phase before making the system available to the end user. During this process the service provider is required to use a smartphone to collect readings of the magnetic field from all the pedestrian-accessible areas and create a static annotated map of the indoor space. In real-world scenarios, end users might own a different smartphone model than the one which was used for fingerprinting. 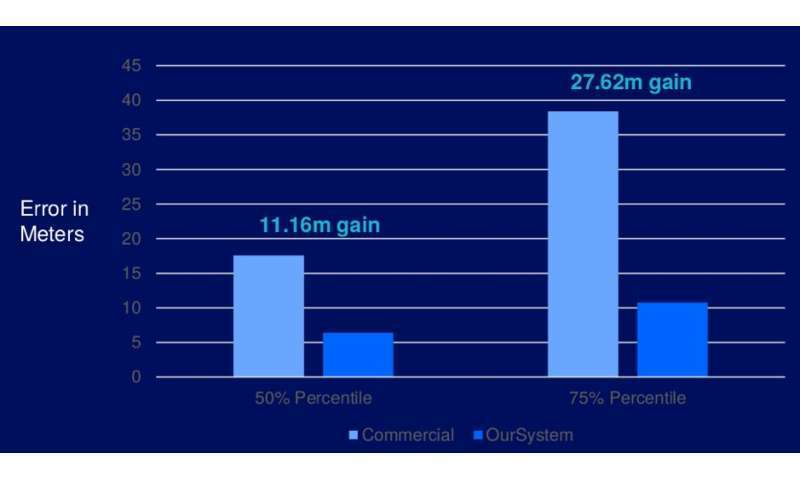 In our work, we quantify the losses in accuracy which indoor positioning systems suffer as a result. Our system is adaptive and continuously retrained and thus maintains high accuracy across users and different smartphone models. Our idea was to analyze the positioning sessions of the end users to enhance our system's knowledge base for the magnetic field readings for the different smartphone models. Once the user exits the smartphone indoor positioning application, we process the recorded sensor readings in our cloud infrastructure and attempt to reconstruct the user's path. We call this novel technique "route inference "and it is based on particle filters and shape-matching. It allows us to add new layers of information to magnetic maps of the area. As a result, subsequent positioning sessions of users with the same smartphone model have higher accuracy. Our experimental evaluation of the tool shows significant accuracy improvement when compared with a leading commercial solution based on magnetic field positioning. Specifically, it improves accuracy compared to commercial alternatives by approximately 15 meters on average. 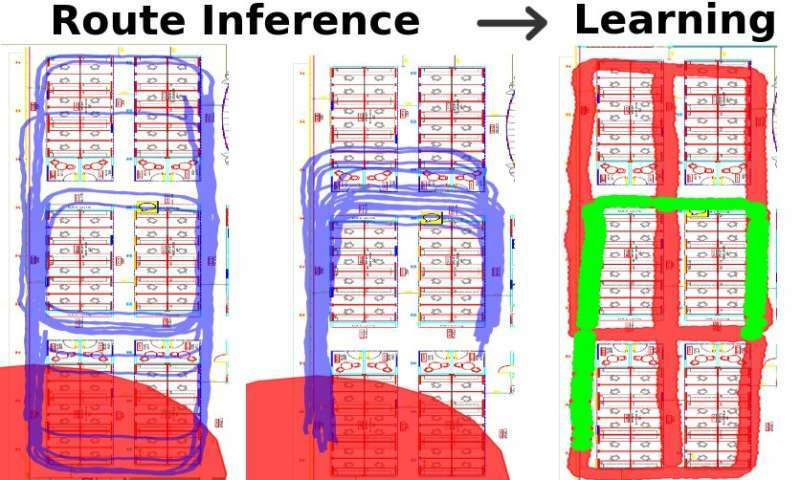 These findings were recently presented at the International Conference of Indoor Positioning and Indoor Navigation (IPIN) 2018). This self-learning AI tool can provide a low-cost solution to facility owners requiring no system retraining. Facility owners and operators can quickly benefit from this tool by using it to make better planning decisions as well as provide a seamless experience to their end users. With our tool, finding a meeting room or hot desk, running for a departure gate in an airport, looking for a lecture hall on a university campus, visiting a patient or attending an appointment in a hospital, or even locating a product in a retail shop using a smartphone could be quicker, easier, and more accurate.